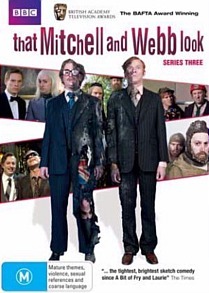 That Mitchell and Webb Look Series 3 DVD Review Definitely for fans of Mitchell and Webb or for those who enjoy great British comedy! Robert Webb and David Mitchell are comedic geniuses and if you have seen the excellent TV series Peep Show, than you will know why. However as opposed to the sometimes crude and politically incorrect Peep Show, they have another series called That Mitchell and Webb Look which is a collection of short sketches which more akin to Hale and Pace with their quirky characters and sometimes ridiculous yet highly entertaining scenarios. I mean... a post apocalyptic game show or a homophobic cook... that's definitely a WTF moment in itself! With this in mind, the ABC have released series 3 of That Mitchell and Webb Look that not only returns this comedic duo to some of their favourite characters like Sir Digby Chicken Caesar, the drunken detective or the Lazy Writers but they also add some very entertaining characters. Like most comedy series that focuses on segments, some of the characters are a little bit of a hit and miss but for the majority, That Mitchell and Webb Look series 3 is truly Champaign comedy at its best. Although series 1 was a little rough around the edges, Mitchell and Webb have definitely found their feet and just like all their comedic sketches, I was in hysterics with this current DVD release. My favourite characters in series 3 is Hennimore, the bumbling idiot and of course Santa's deeply troubled challenged brother. The series must be seen to be believed and the experience is definitely worth it. Just be on the look out for a very weird and highly disturbing sketch that involves Queen Victoria! Definitely for fans of Mitchell and Webb or for those who enjoy great British comedy! This series is delightfully entertaining!